Since 1945, Brown Jordan has designed luxury leisure furnishings and accessories that transcend time and liberate the senses. 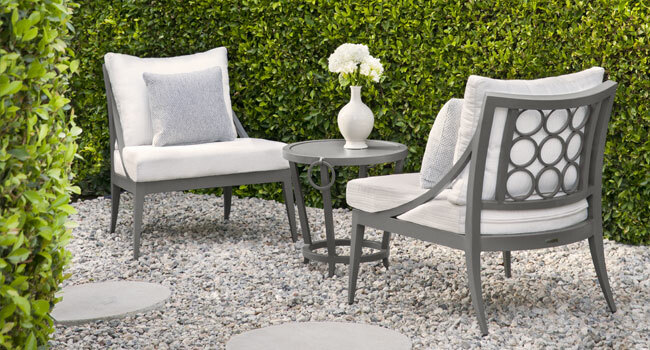 Established by Robert Brown and Hubert Jordan in Pasadena, California, Brown Jordan was the first company to create furniture for full-time outdoor use. The first of these innovative designs, constructed of tubular aluminum and vinyl lace, was fittingly called “Leisure” and marked the birthplace of outdoor furniture. Brown Jordan furniture is designed to complement your leisure lifestyle. The Brown Jordan portfolio features more than 30 collections in a range of design styles. Distinctive silhouettes are hand- and machine-crafted into high quality furnishings that enhance traditional, transitional, and contemporary environments. Our collections are appropriate for residential and contract environments, both indoors and out. Known for producing stylish, award-winning designs, we have built a reputation on more than 60 years as the industry leader in innovation and design integrity. When you aspire to the best in luxury leisure furniture, look to Brown Jordan. To view fine patio furniture that Brown Jordan offers, click here.